I’d like to invite you to take part in an interesting project. For some while now I’ve been thinking about using the Bioscope, and the collective knowledge of its readers, to produce a research resource of some kind that would benefit the silent film studies community. And so I’m announcing the creation of the Bioscope Bibliography of Silent Cinema. The aim is to create as comprehensive a bibliography as possible for early and silent cinema, using the catalogue of the British Library. The Library (my esteemed employer) recently published an experimental version of its online catalogue which allows registered users to tag, comment upon and sort records, and export data to annotation programmes. The aspect that interests me in particular is the tagging. This enables you to mark any titles in the catalogue with a keyword of your choosing. This facility hasn’t been used much as yet, but to me it seems a marvellous opportunity for creating catalogues. All one needs to do is to establish a keyword, assign it to every title that comes under that category, and you have your own catalogue. If it is a major subject, such as silent cinema, then you could make it a collective endeavour, benefitting from the shared wisdom of an intelligent crowd. Hence this project. This is only open to those with British Library reader’s passes. The test catalogue can be consulted by all, but only those who sign in (with your reader number and password) can add tags. The tag I have created is “silent cinema”. All you have to do is select a book title from the catalogue; on the right-hand side of the record (see example below), under Tagging, you will see the instruction Assign/Remove Tags. Click on this and a box pops up inviting you to add a tag. You type in “silent cinema”, click on Save, and it’s done ((once you have done so, for the next title you click on, the tag will appear as a check-box automatically). The beauty of the system is that anyone can use the same keyword, so a team of people can be involved. The British Library doesn’t have every book on silent film, but it has most. Moreover, this new version of the catalogue includes journals and newspapers (titles, that is, not individual issues), theses and music scores, with other media to follow in due course, such as manuscripts and sound recordings. I’ve no idea how long this bibliography might be eventually (a few thousand titles, certainly), but what the catalogue programme does is to break down the titles under any subject (such as “silent cinema”) by author, publisher, decade, material type, language or narrower subject, which aids searching and encourages discovery. I have tagged some 430 records already, and you can see the results here: silent cinema. Now I hope there may be some of you out there who will be willing to take part. Obviously some management is required. I have started to tag all the books indexed under ‘silent film’, but there are a great many that are not traceable that way. The books of the silent era themselves were not titled or classified as ‘silent film ‘ or ‘silent cinema’, and for the earlier years they may have been classified under photography, or theatre. Hidden or obscure titles can be brought to the surface in this way. One can select titles that one knows; one can select by author, or keyword. What I suggest is that anyone who is interested should get in touch, either via the comments to this post or through www.lukemckernan.com, and say which area you’d like to cover. It could be an author, a sub-subject area, a language of publication, a country, or whatever. I can then keep a record of what has been done. Some rules to follow: make sure you tag every example of a title (the BL sometimes has more than one copy of a book); in choosing titles you should make sure they are relevant to silent cinema (and its antecedents), but you can include works that are not wholly about silent cinema (e.g. cinema histories); you must keep to the tag exactly as written (“silent cinema”); don’t interfere with anyone else’s tags. You can include novels (how useful it will be just to have a list of the literature of silent cinema), indeed anything that relates to silent cinema in one form another, published at any time. I haven’t attempted to define what silent cinema is. If in doubt, include it. And then what will be do with such a work? Well, it will become – if enough people contribute to it – an invaluable research tool for all of us. It won’t just list all of the silent cinema books we can identify, but it will classify and sub-divide them. It will enable easy searching of themes. It will reveal titles that won’t turn up in conventional catalogues. It will open up new areas of study as different media that cover silent cinema are brought together. It will grow as new titles are published. And additional features and means to manipulate the data will emerge as the British Library further develops the functionality of its catalogue. One could even imagine other libraries, when have have similar catalogue functions, also being mined for silent cinema subjects and some glorious joint catalogue being created. This will be a long job. I’ll be taking on the bulk of it, and I’m not expecting anyone to volunteer for a massive amount of tagging. You could simply select a dozen or so titles. Just let me know that you are interested, so that the project can be monitored. Remember, only those British Library reader passes can take part – but everyone can benefit from the results. To me it seems a good initiative. I’m happy to contribute. Let me know. Another fantastic and very helpful inititiave by the wide-awake Bioscope. Congrats ! I’d love to contribute. Is there a way to get a reader’s pass without crossing the Channel ? I couldn’t find one on the BL website. Thank you both for your interest. The problem with this plan is that it is limited to British Library readers only, and you can only get a reader’s pass by visiting the place (and having the right documentation on you). One can imagine research libraries of the future issuing online passes as more and more content gets digitised and delivered over the web (indeed some models for this are start to appear already), but not just yet. 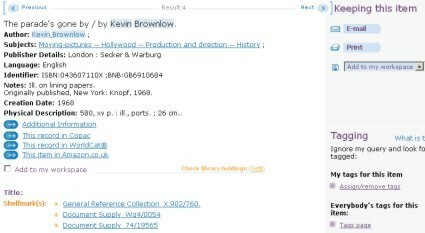 For the record, these are the search terms I’ve used so far to identify and tag titles from the BL catalogue: silent films, silent film, kinematograph, kinetoscope, kinemacolor, bioscope, biograph, cecil hepworth, w.k-l. dickson, charles musser, kevin brownlow, rachael low. There are 435 titles tagged as of 28 July 2009. 57 more titles added, using keywords Georges Méliès and Georges Sadoul. Now added books by Anthony Slide and William K. Everson. Total now comes to 535. A bit of a gap since I last attended to this, but another sixty or so titles added – including books by Richard Abel, Richard Koszarski, Jay Leyda, David Robinson and books with ‘silent screen’ in the title. Slow progress, but I’ve now added titles traceable under cinema muto, stummfilm, Ken Wlaschin, nickelodeon and Ian Christie.